Do you love dogs? I’m sure you do. Who doesn’t, right? Just look at this one pup here. Check out that great smile. You can see really see how his face lights up. His tongue hanging out because he’s too excited. His eyes squinting because he just wants to let you know that he’s so happy to see you. And if you don’t smile or say “awww” while looking at this then you seriously have a problem. Now, we all know that dogs are called man’s best friend. We all know the reason for it. They’re loyal, trustworthy, and give unconditional love. But the sad thing is we often don’t return this love back. We often leave them in cages. We don’t play with them. We don’t walk them. We don’t spent time with them. The worse part is when they do something we don’t like, like chew our slippers or “mark their territory” in places they shouldn’t, we just shout at them and blame them for not knowing any better when we didn’t even teach them how to behave properly. Sometimes, we even just let them wander around outside our houses. We don’t care what happens to them, where they go, nor what they encounter out there. In other words, we don’t love them back. These actions often put dogs in a very bad predicament. 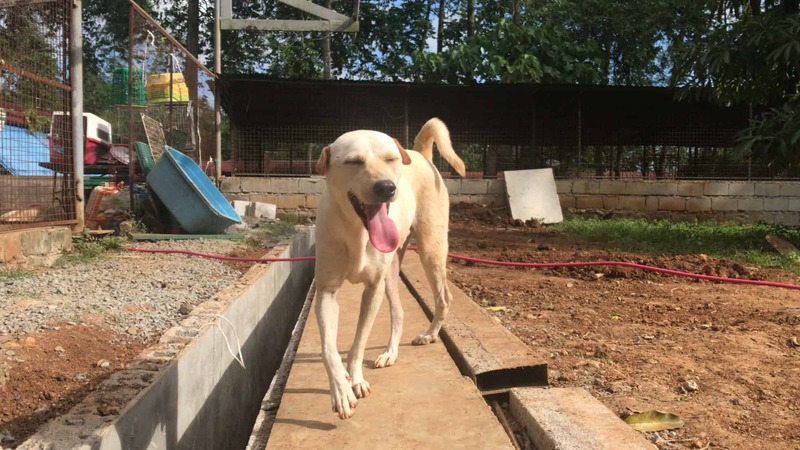 We often see videos on Facebook or Instagram about dogs being rescued and being cared for. We react to it or even cry for them. But we don’t do anything about it. I visited MBY Pet Rescue and Sanctuary two weeks with a couple of friends. I heard about it from my wife last year and said they needed some donations for food and other medicines. So, we went there with a couple of donations. I’ve got to be honest. It was a long and tiring trip. But it was all worth it. When we got there, we didn’t know that it was the place. We had to ask around if we were at the right place. We used Waze and it was pretty accurate. 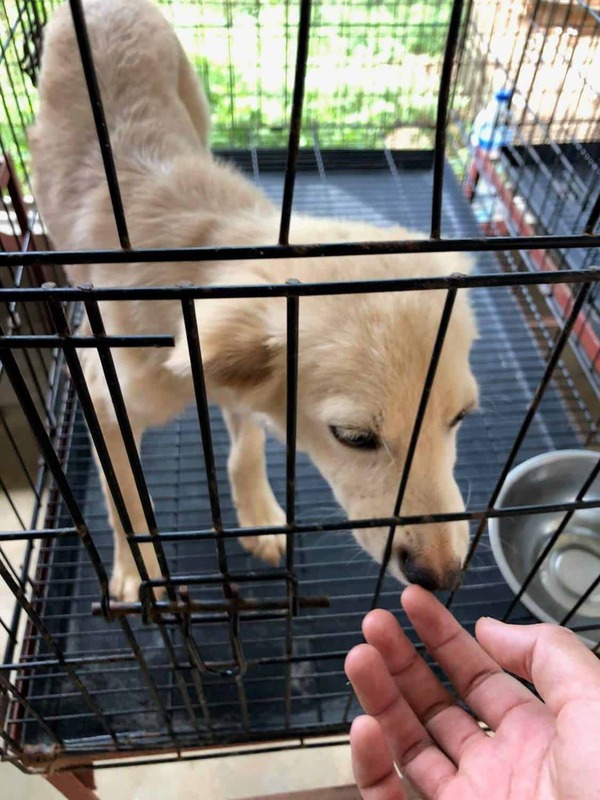 If you want to visit, play with the dogs and cats, or even better, volunteer to take care of them or drop off some donations, you can just type it in Waze and just follow the directions. When we got there, we immediately got greeted by lots of dogs. We were told they don’t usually get that many visitors so obviously they were so happy to see us. If you’re a dog owner, you know what I’m talking about. You hear them barking. They greet you at the door. Their tails wagging excitedly. Sometimes they jump up and down. They try their best to lick you to show them how much they missed you and love you. Even if you were only gone for 10 minutes. That’s just how they are. And that’s exactly what these dogs were doing. They were happy too. The only difference is that some were also scared. Some of them just stayed back. Some are injured and can’t literally walk up to you. They don’t know you. To them, you might just hurt them. You might just be someone they love unconditionally yet won’t return the favor. Because that is exactly what happened to them. The sanctuary houses over 500 dogs and 300 cats. 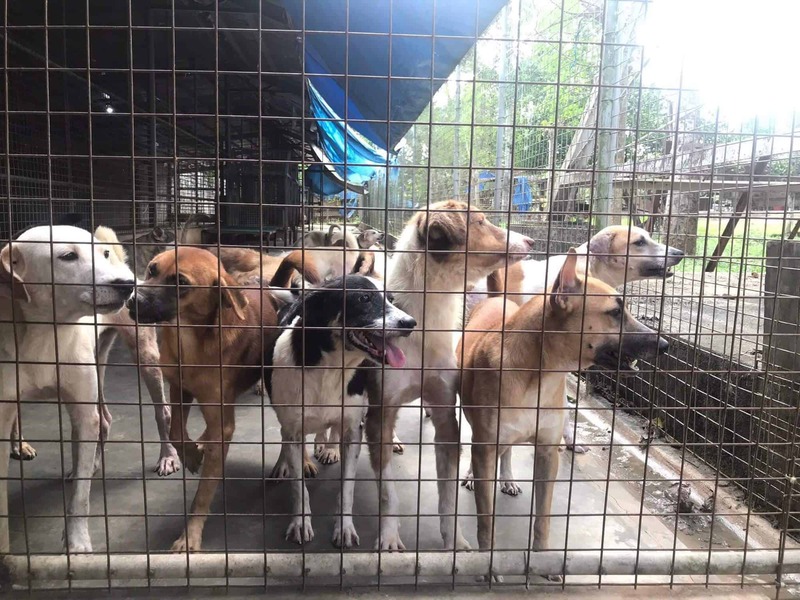 They were all rescued or abandoned by their owners. The sanctuary has been running for ~3 years now. It’s very depressing to see and hear their stories. 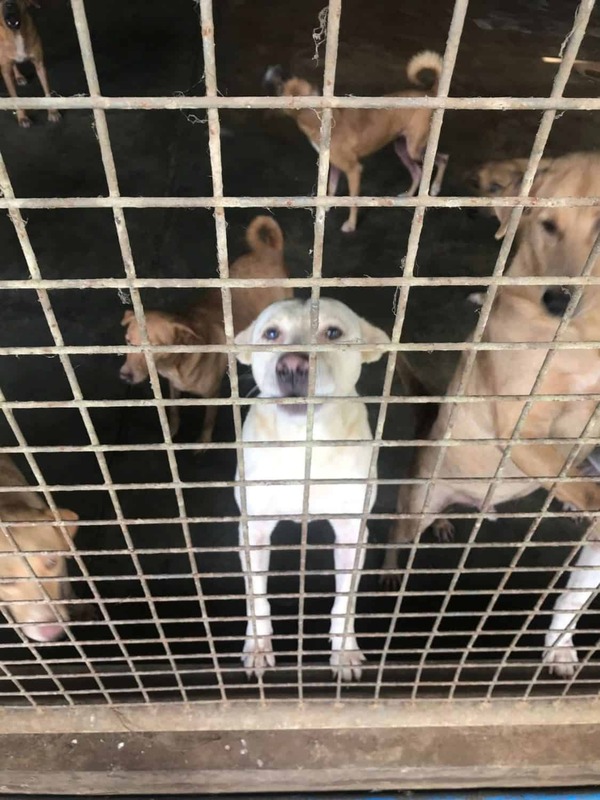 Before I show you the place and share the stories of some of these dogs, I’d like to say one thing that’s supposed to be clear to anyone who’s an owner (of any pet). Don’t let your pets wander around outside. If you can’t give them time, proper food, and attention, don’t bother getting one. First of all, the place is huge! Unfortunately, the owner wasn’t there when we visited. We were told she went out to rescue a couple of dogs that morning and hasn’t returned yet. So, we didn’t get any insight as to the reasons why she started the place, the backgrounds of the pets rescued, etc. When you get there, you’ll notice two enclosures — the high perimeter wall made of concrete and a fenced wall. This ensures that when you open the gate for vehicles or for people coming in, the pets inside the fenced wall can’t just come running out all at once. And if there are a few dogs between the perimeter and fenced wall, it’s much easier to rally them back inside. When you go inside, you’ll notice a couple of sections. We don’t really know if these sections mean anything. The only thing we know is that all the cats are in one big area primarily because they are more prone to wander around. Shelter and water is readily available to both cats and dogs. It’s the food that’s where the sanctuary needs your help. Imagine feeding 500 dogs and cats. One of their posts on Facebook said they need 11 bags of dog food daily. Warning: Some of the following images are graphic in nature. 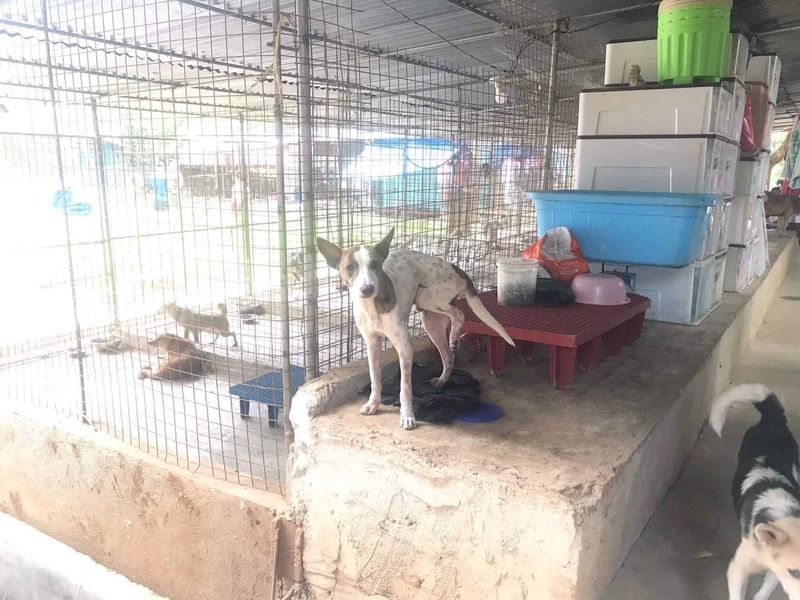 Here are couple of photos of the dogs inside the sanctuary. Most of them were fine. 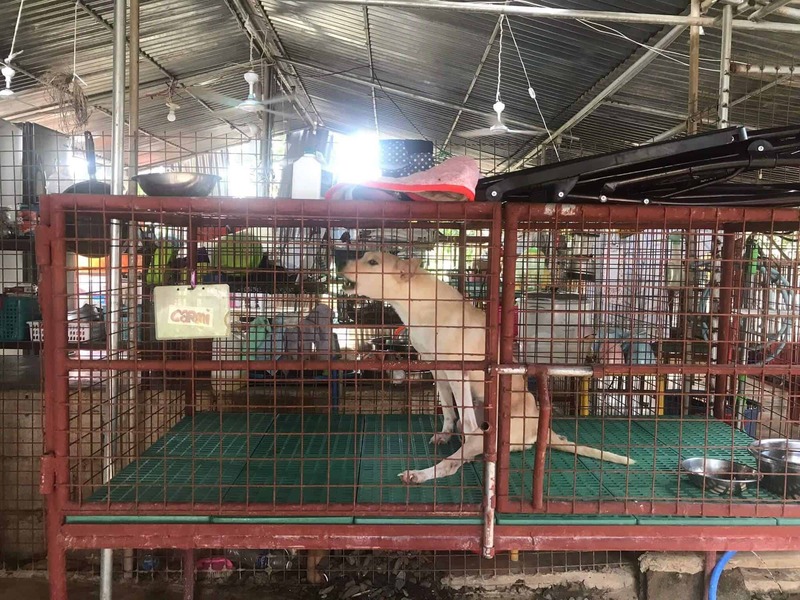 But, when you walk around further, you’ll notice some inside cages like the ones we have at home. 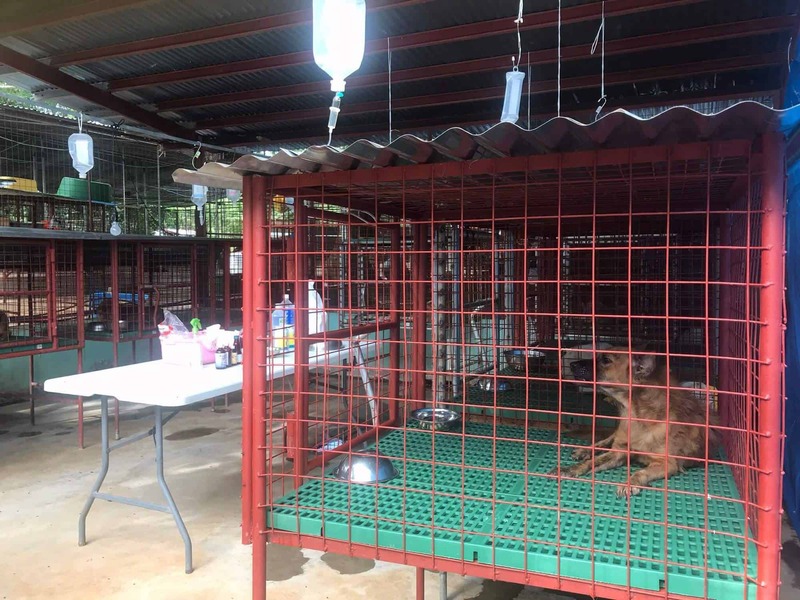 We were told the pets inside the cages are either sick, injured, or being nursed back to health. For example, the moms and her babies are together. If you look at the image above, you’ll see that there’s a table in the middle with medicine. And if you look closely, you’ll see there are a couple of dextrose bags hanging above the cages. These are all for the dogs in that section. 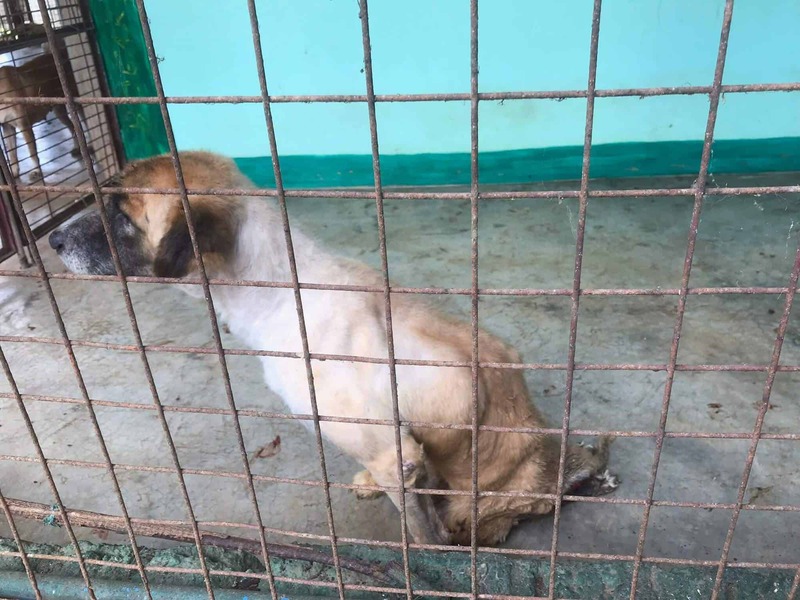 While we saw one “injured” dog wandering around and not in a cage, he’s in a better shape than what you’ll in the other cages. Here’s a dog who had an accident. We didn’t know what accident. But all we know is that there’s a hole in his skull. Yup, you read that right. It’s between the dog’s eyes and nose. 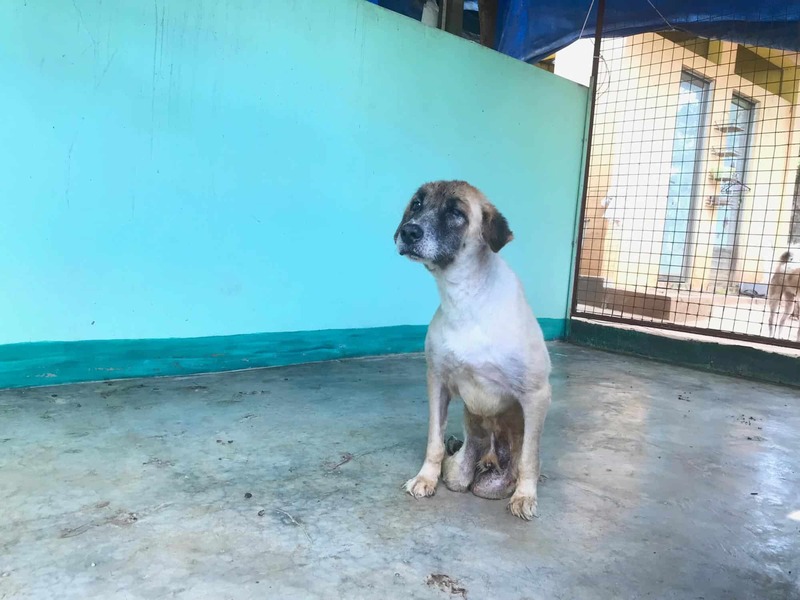 Here’s another dog who was most probably hit by a car (and hopefully not by another person). Her name is Carmi. As you can see, her left leg is extended. She can’t fold it nor move it. So the way she sit, stand, and walk are all affected. But that’s not the worst thing I saw that day. It was this dog who was most likely run over by a vehicle. His injuries are so severe he can’t use his two hind legs. If you have the courage, you can play this video to see how he just drags himself when he walks in his cage. You’ll also notice trails of blood while he’s dragging himself from one place to another. He’s trying his best to live, but you can see it in his eyes that he’s in pain. 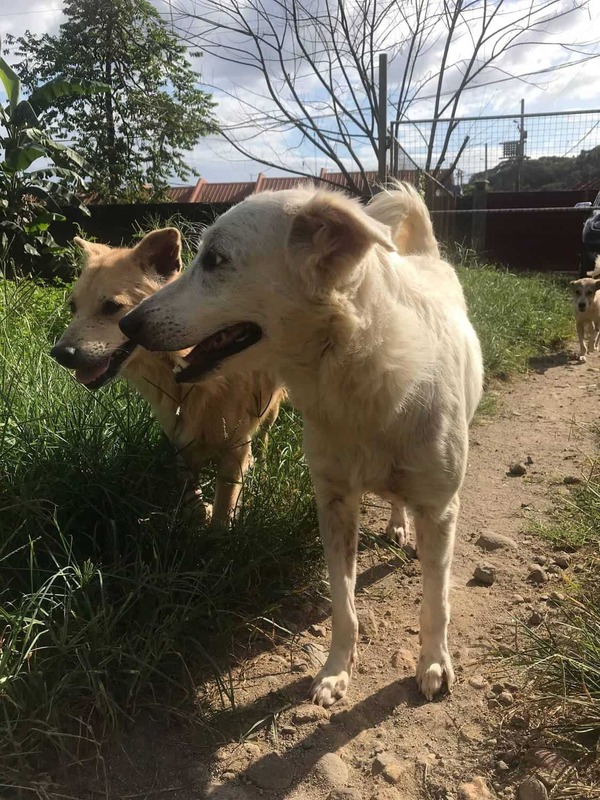 Apart from these sick and injured dogs, there were a couple of really healthy pets who were just left behind by their owners. The reason? They can’t take care of them anymore. Personally, it’s not ok. But that is definitely better than not taking care of them or just letting them out of your house and hope they live. 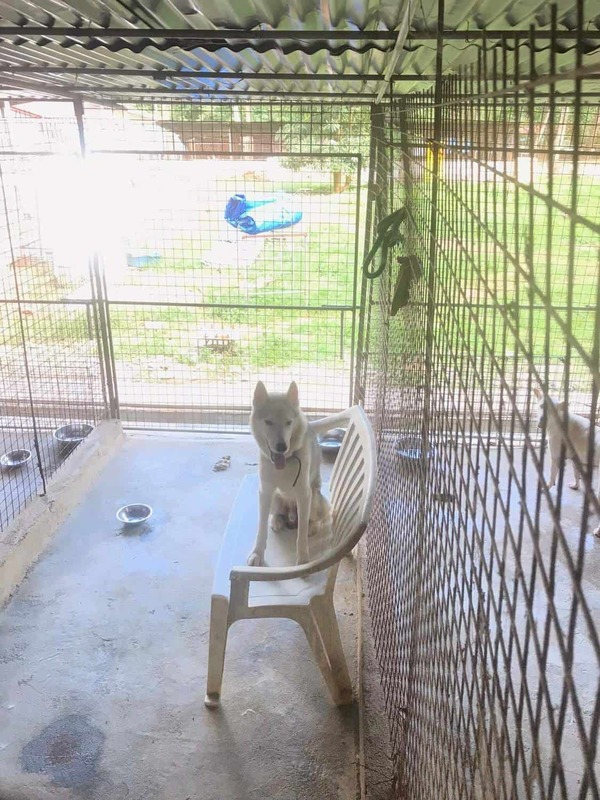 Here’s a Husky — I was told that the owner abandoned her because they couldn’t take care of her anymore. 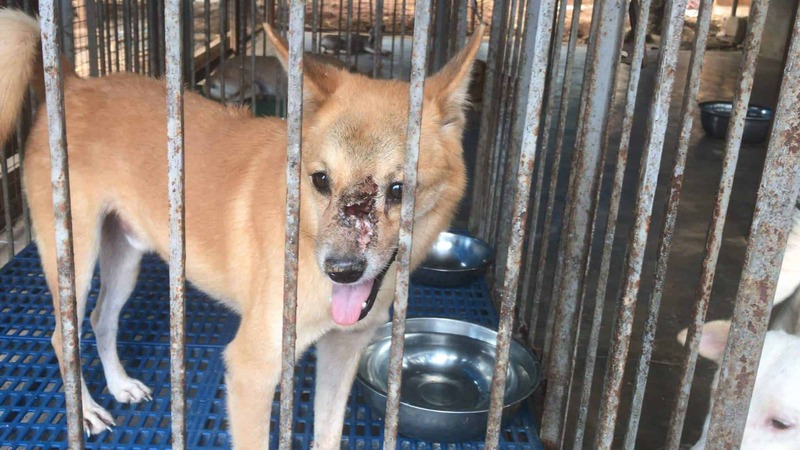 These cats and dogs are in dire need of your help. I have three dogs and I know they take up a lot of time and resources already. Imagine having over 500 dogs and cats. 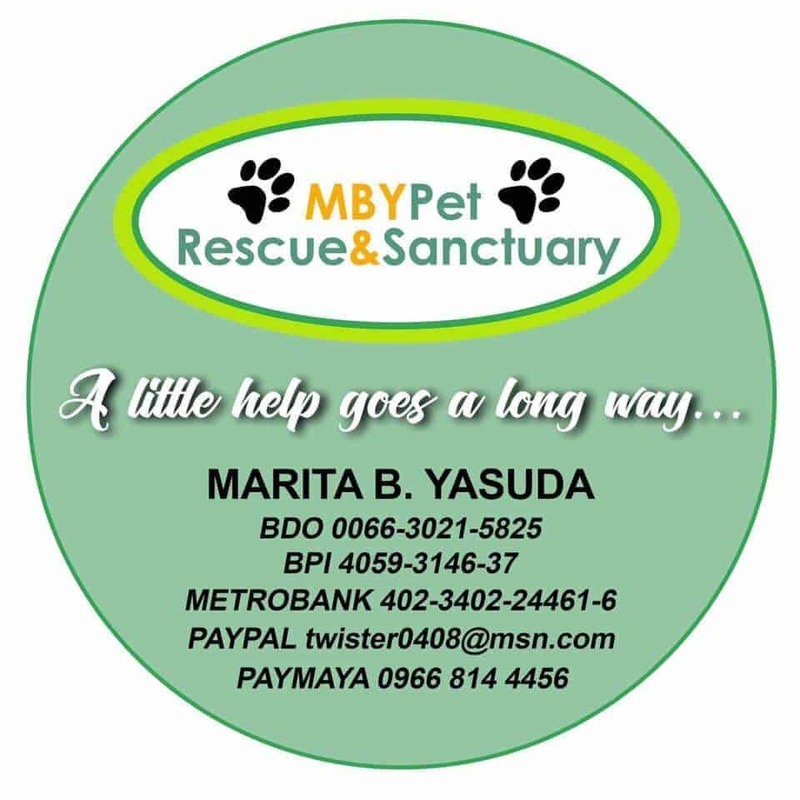 If you can provide any help — monetary, time, in kind — you can reach out directly to MBY Pet and Rescue Sanctuary. You can drive there with your friends and drop of your donations as well.